Conclusion: An ideal finishing touch for Wurger fans. Model aircraft wheels often leave a bit to be desired, whether they were anemic or lack detail on either the hub, tread or brake side. 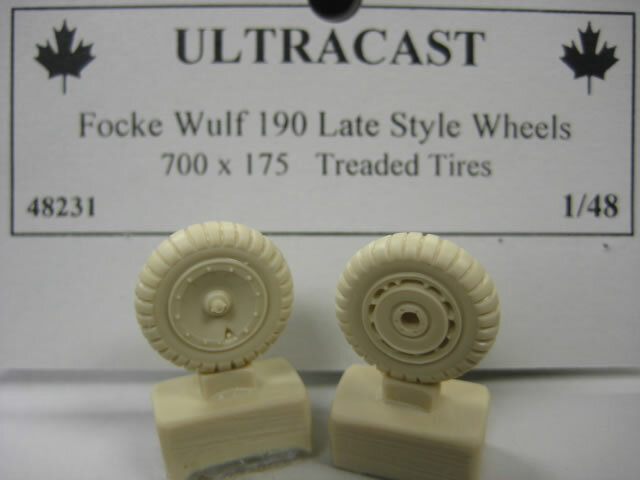 Ultracast has provided an answer for both early and late model FW-190s. 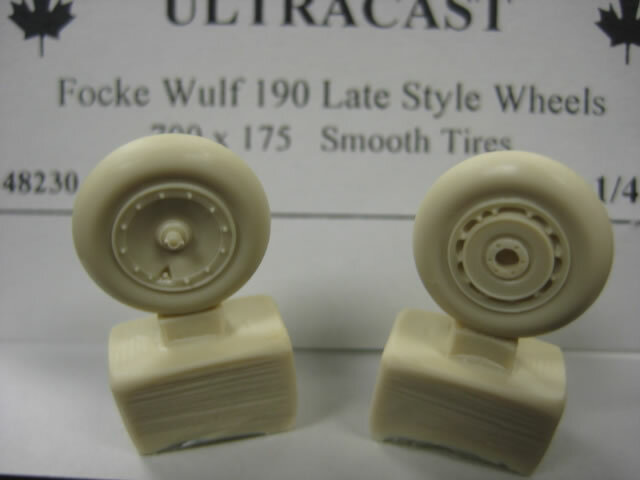 Molded in light cream colored resin the wheels are perfectly molded with no blemishes or imperfections. This is the typical quality that I have come to expect from Ultracast. 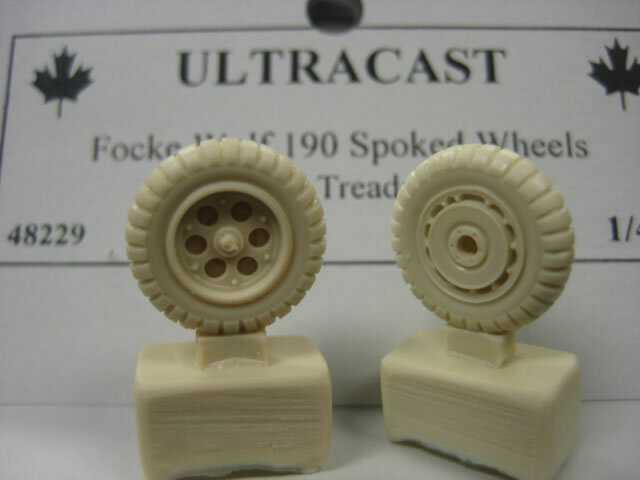 Unlike other aftermarket manufacturers Ultracast’s tires show a realistic bulge. Not the flat tire syndrome that some aftermarket wheels have but a realistic scaled weighted appearance. Removal of the tires is a simple swipe with the razor saw or knife blade. Only the area where it is removed from the pour block is the only place that needs cleanup. There is no ‘seam’ around the circumference. The wheels feature a hole for the axle that will fit most kits. This ensures that the axle is centered. Often times a Focke Wulf 190 will have different types of tires on a single airplane. The one that immediately comes to mind is the FW-190D-13 “Yellow 13” which had a smooth and treaded tire. Well now you can do it justice. 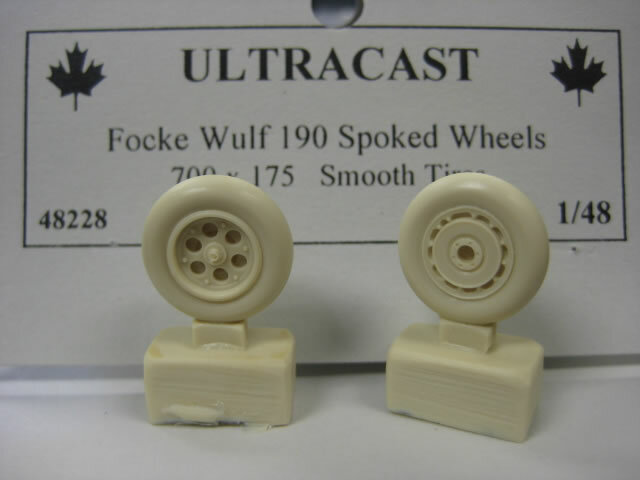 Simple cleanup and beautiful detail without any bubbles, perfect additions for your Focke Wulf model.